This question is about as old as both design. What most divers don’t realize are how different the designs actually are and under which conditions they perform best. While piston regulators feature fail safe down-stream valves and open unobstructed, delivering unrivaled amounts of air while extremely responsive, Diaphragm first stages require far more parts to work, open against the flow (so called Up-Stream Valve) and deliver smaller amounts of air due to the restricted air flow in it’s air-ways. Both designs have its strengths and weaknesses. The Landrover of all Regulators. This type of regulator is a reliable work-horse. With only two moving parts and minimum maintenance requirements is the Landrover of all regulators. 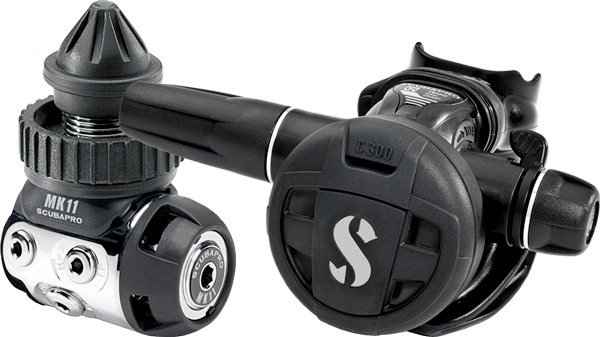 Since the cost of ownership is minimal, it is found in most dive shops as rental regulator. It is also popular for it’s small size and low weight with travelers and used as stage regulator in the technical diving scene. It is suitable for moderate to warm temperatures. The valve mechanism opens with the flow, a so called “fail safe – or – down stream valve”. 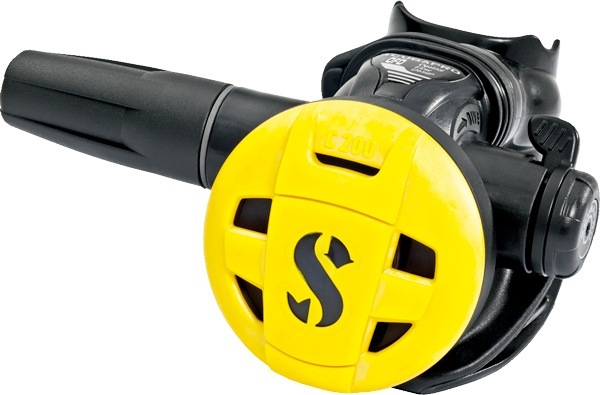 This valve is able to open unobstructed and delivers large amounts of air on demand. Since the design is unbalanced, the tank pressure influences the Intermediate Pressure (IP) slightly. The IP drops as the tank pressure decreases. This in general results in slightly higher breathing resistance towards the end of the dive. The design has a open water chamber, allowing water to enter and act directly onto the piston, compensating for depth and adjusting the Intermediate Pressure accordingly. 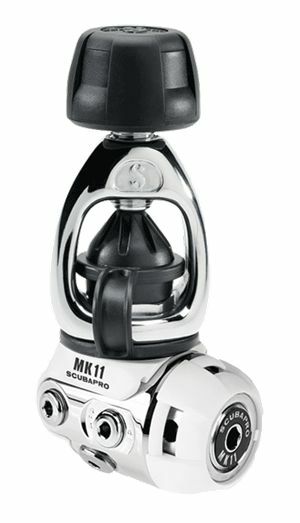 The most popular model in this category is the Scubapro MK2 which was first introduced in 1963 and has been updated over the years. It is currently available as DIN 300bar, Yoke 200 bar and Nitrox Version to 100% O2. The Balanced Diaphragm Regulator is a popular design, working on the Upstream Valve Concept. 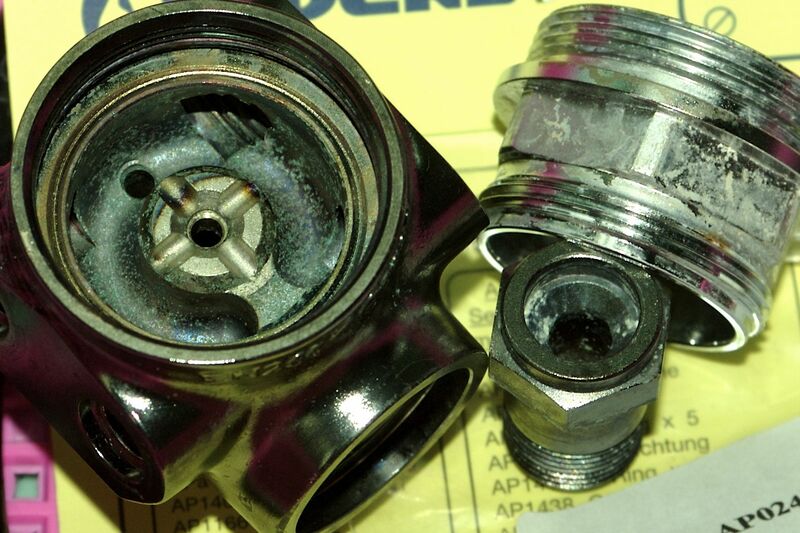 This type of valve opens against the flow of the air. The design is far more complex as compared to the Unbalanced Piston Design, resulting in 7 or more moving parts. A pin which runs through the center of the Orifice, reducing it’s opening controls the valve. This results in a reduced airflow as compared to other regulator designs. The advantage of the design lies in a fairly compact size. The absence of a water chamber means no water enters the first stage reducing the risk of icing. The Water pressure is transmitted through a flexible Diaphragm. In our experience the complex internal structure of these stages attract and accumulate more dirt, dust and debris as compared to other designs resulting in significant internal corrosion if not handled properly or if poor air quality is used. The Environmentally sealed Diaphragm Regulator is a basic upgrade from the open Diaphragm Regulator Design. It features a second diaphragm which seals the otherwise exposed spring against the environment, sealing all moving parts from the water, leaving only the external Diaphragm exposed. This also results in a lower temperature within the first stage as the water is not able to warm the stage as effective. This can result in serious internal icing of the stage if the breathing air is humid due to not properly maintained filter systems of the compressor system used filling the tanks. This fully environmental sealed design is suitable for extreme contamination, liquids other than water and Water temperatures below 4 degrees Celsius in combination with suitable air quality. There is no significant performance difference between standard Diaphragm and Environmentally sealed models. Some manufacturers achieve a slightly better response to IP changes by using a thinner internal Diaphragm. The goal of the so called “Over Balancing / IP Boost / Intermediate Pressure Amplification” is to reduce the breathing effort with increasing depth. It is offered by many different manufacturers. In Diaphragm First Stages it is in general achieved by using a larger size external Diaphragm as compared to the inner one. With increasing depth and therefore increasing ambient pressure, the Intermediate pressure is artificially increased beyond the normal compensation for the depth. The result is a reduced breathing effort at recreational depth but renders the design unsuitable for technical diving as there is no limitation to the increase with increasing depth, risking failure or free-flow of the system. The Regulators with Flow-Through-Piston Design have the highest air delivery in the market due to the large piston travel and wide, unobstracted opening of the valve assembly allowing vast amounts of air to be delivered on demand. The valve works with the “fail safe” down stream principle and there are only two moving parts in the design making it extremely reliable. The flow-through-piston out-performs diaphragm regulators especially at low tank pressures with it’s wide opening valve assembly allowing sufficient air to flow to keep the Intermediate Pressure stable and retain performance even with more than 1 second stage in use. As in the standard piston regulator, the water pressure acts directly onto the piston. In older designs oil or silicone grease was used to transmit the pressure. Current models allow water to enter the water chamber and different technologies are used to prevent icing of the regulator through insulation and non-stick materials. Some models feature ribs to increase the surface and dissipate the cold more effectively enabling the use in cold-water conditions. In most cases LP-Hoses are connected to Swivels allowing flexible hose routing. There is no depth limitation for this type of regulator as the water pressure increases the Intermediate Pressure linear. This entry was posted in Uncategorized on June 20, 2011 by pacificadive. 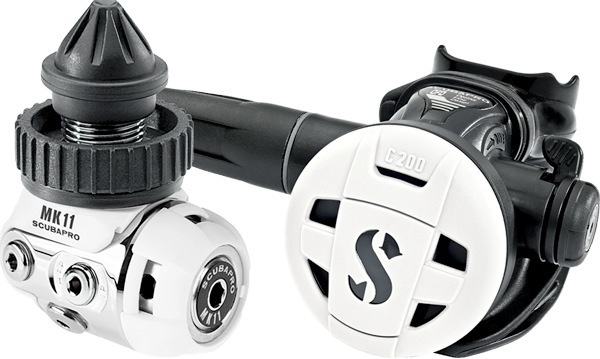 We just received the brand new Scubapro MK11 LIGHT, C300, C200 White as well as C200 Octopus. 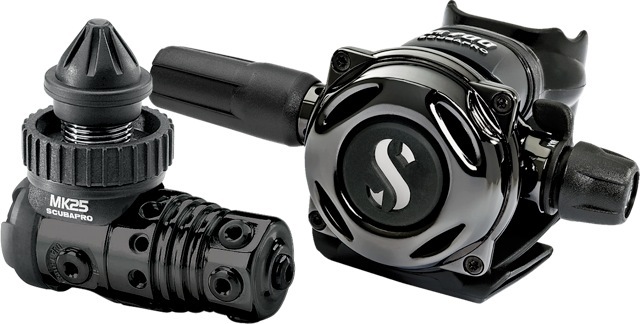 All models offer uncompromised breathing performance for recreational divers. 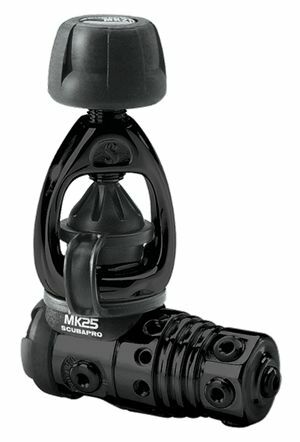 The new MK11 LIGHT balanced Diaphragm First-Stage is more compact and lightweight without affecting reliability and performance. This entry was posted in Uncategorized on June 16, 2011 by pacificadive. The regulators have a new Vapor Deposit Coating which is almost 3 times harder as compared to the standard chrome finish. DIN and Yoke models are available. This entry was posted in Uncategorized on June 15, 2011 by pacificadive. The Main Phone Number of Pacifica Dive Manila has changed.